The Philippine Science Journalists Association Inc. (PSciJourn) and the India-based International Crops Research Institute for the Semi-Arid Tropics (ICRISAT) on January 4, 2008, signed a memorandum of understanding (MOU) in order to forge partnership, cooperation and coordination on matters relating to innovative agricultural research and capacity building for sustainable development. Angelo Palmones, PSciJourn president, and Dr. William Dar, ICRISAT director general, signed the MOU. Meanwhile, the new set of officers and members of the board directors of PSciJourn were inducted into office by Dr. Dar also on January 4 at the Sulo Hotel in Quezon City. Sworn into office were: Angelo Palmones, president (DZMM-ABS-CBN), Aristotle Carandang, vice president (National Academy of Science and Technology, and Malaya newspaper); Lyn Resurreccion, secretary (BusinessMirror); Susan Layos, treasurer (DZME); Madel Sabater, auditor (Manila Bulletin); Melly Tenorio, PRO (DZRB); Ruby Cristobal, director (Science Education Institute) and Victoria Bartilet, executive director (Science and Technology Information Institute). 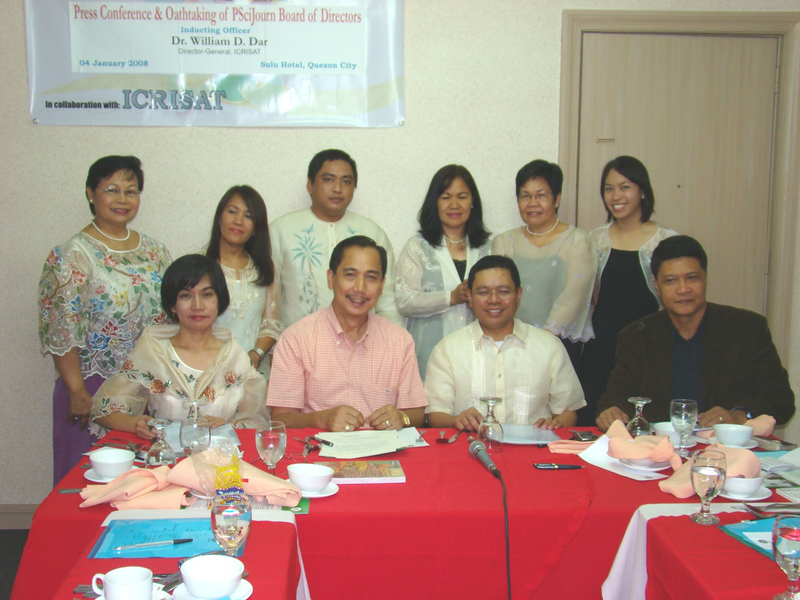 PSciJourn was organized in 2001 with Mr. Palmones as founding president. PSciJourn is a nonstock and nonprofit association of science journalists, science and technology (S&T) communicators and advocates committed to create a science consciousness and culture among Filipinos. It supports public and private efforts in developing a science-oriented citizenry by promoting public awareness, understanding and appreciation of S&T. PSciJourn creates a pool of science journalists, and works out training and scholarships programs for S&T journalists. On the other hand, ICRISAT is a nonprofit and nonpolitical organization that does innovative agricultural research and capacity building for sustainable development with partners across the globe to serve the poorest of the poor in the semi-arid areas of the developing world. ICRISAT adopts integrated genetic and natural-resource management as its overarching research strategy to attain scientific excellence and relevance in agriculture in the semi-arid tropics, focusing on key livelihood and income opportunities to improve the well-being of the poor with equity, multidisciplinarity, sustainability and community participation as core principles. Both organizations will promote a higher level of S&T consciousness and understanding among media practitioners in the country. Specifically, they shall conduct and/or coordinate activities, including media releases, and event coverage of seminars, trainings, conferences, workshops and roundtable discussions. This was published in BusinessMirror Jan. 14, 2008, Science page. PSciJourn, ICRISAT sign MOU; PSciJourn officers take oath | PSciJourn. these comments appear like they are written by brain dead people? The article has truly peaked my interest. I’m going to book mark your blog and keep checking for new information about once per week. I opted in for your RSS feed too. ICRISAT sign MOU; PSciJourn officers take oath | PSciJourn. And I do have a few questions for you if it’s allright. Is it simply me or does it look like a few of these responses appear like coming from brain dead individuals? 😛 And, if you are writing on additional sites, I would like to keep up with everything fresh you have to post. Could you make a list of the complete urls of all your shared sites like your twitter feed, Facebook page or linkedin profile? Usually I don’t read article on blogs, but I wish to say that this write-up very pressured me to check out and do so! Your writing taste has been surprised me. Thank you, quite nice article. this webpage consists of awesome and really good data in favor of readers. I think this is exactly the most very important information in my view. Not to mention i’m thankful browsing your current page. Nonetheless might statement concerning variety of all round factors, The web site fashion is right, any web content is absolutely fantastic.